In full landscape mode, AstroConnexions has two views (#1, #2) with different aspect grids. Each view uses a different aspect grid design. 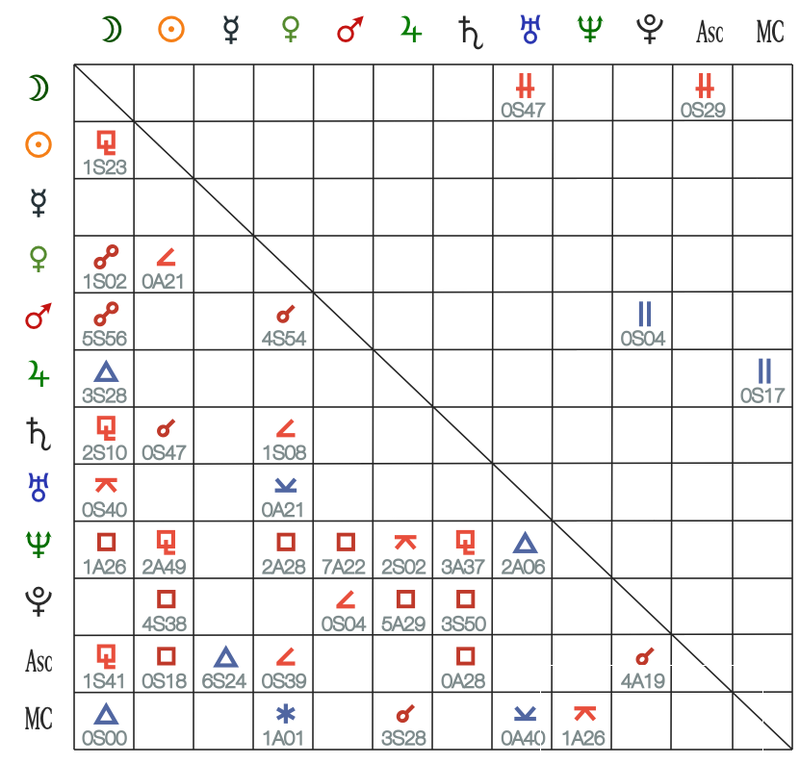 This grid shows aspects measured on the ecliptic, and parallels of declination. Aspects are read horizontally then vertically. For instance, the aspect Moon opposite Mars is separated by 5 degrees and 56 minutes of longitude and is separating – notated by the S (Separating). A = Applying. 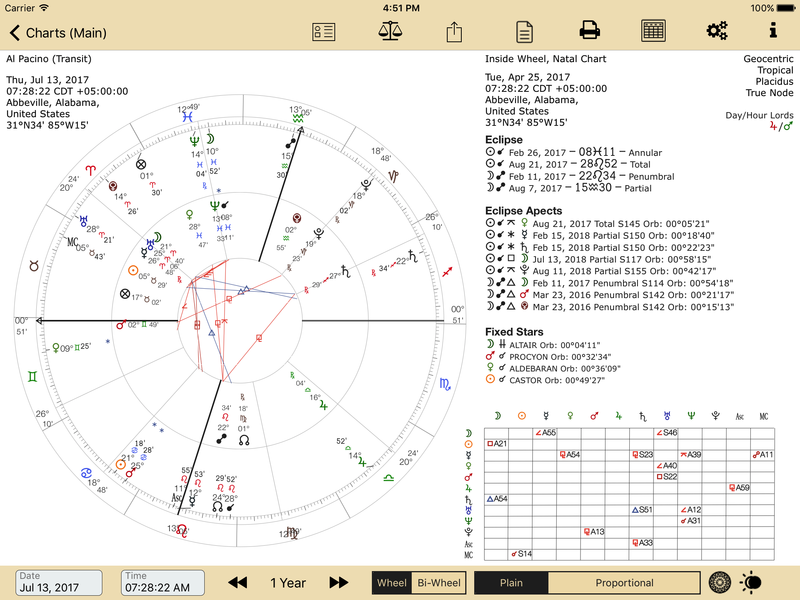 The aspect is not read Mars Opposite Moon ie looking first downward and then across, but Moon then looking downward to find Mars. The aspect grid for a bi-wheel is slightly different. No declinations of parallel are shown. 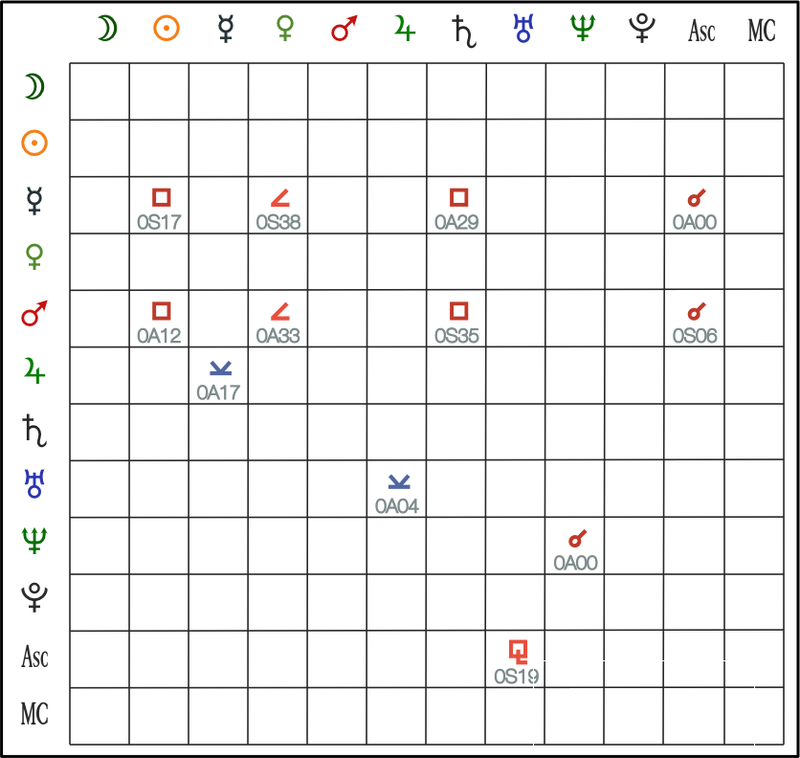 Aspects such as Sun progressed to natal Sun are possible so the grid has to be able to display this type of aspect. Note that declinations are not shown, and that fractional aspect separation values are not shown in the aspect grid. 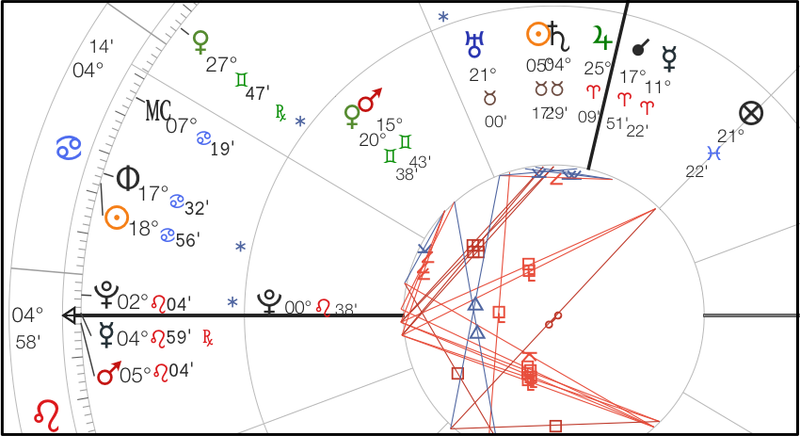 Thus the Moon’s opposition aspect to Venus is shown as 1 degree and separating. This is similar to the traditional bi-wheel aspect grid except that only the fractional part of the aspect is shown if the orb is 1 degree or less. If the orb is over 1 degree the fractional part is discarded and the degree is shown. 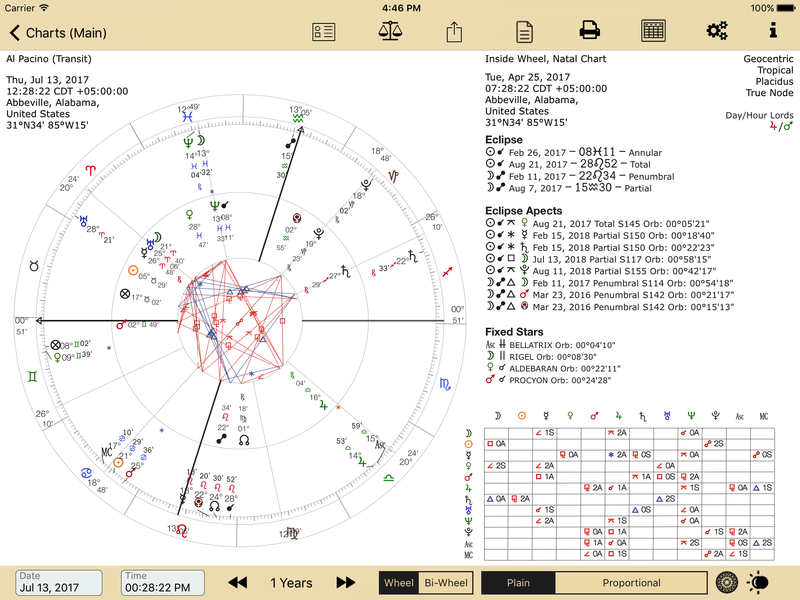 The outer wheel’s aspect to the radical position is read by looking down then across, Thus Mars progressed in square aspect to the Sun is read by locating Mars vertically on the left of the grid, and then across to find the radical Sun. Here the reading is Applying by 12 minutes. The actual separation is 0 degrees 12 minutes, as the orb is 1 degree. Aspect Separation 1:56 (1 degree 56 minutes). Orb 1 degree. The aspect separation is shown as 56 minutes with the aspect glyph, and A if applying, S if separating. Aspect Separation 1:56 (1 degree 56 minutes). Orb >1 degree. The aspect separation is shown as 1 degree with the aspect glyph, and A if applying, S if separating. Similarly, if the aspect separation is 00:35 (0 degrees, 35 minutes) the aspect separation is shown in the grid as 0. Note that most types of charts can have different orb settings.